Color, style, fabric, size, crystals… It is almost enough to make your head spin! But first, relax. Getting the Ballroom gown or your latin dress is as exciting as the dancing itself, and we are here to make sure you have a wonderful experience getting your perfect dress. A little about Designs to Shine gowns…Each gown is one of a kind. They are all built on body forms, not from patterns. They are made to fit impeccably. All gowns are built on a bodysuit (like a bathing suit) with built in bra cups for support. They are meant to be snug, yet comfortable; you need to feel secure. Our designs are inspired from nearly everything around us. Even we are surprised at how versatile our collection is. Nearly every dress is a collaboration of the entire Designs to Shine team, all taught and carefully directed by Maria McGill herself. She puts her touch into every gown, and you can tell. Each dress is really a work of art. Steve Jobs was once quoted: “Design is not just what it looks like and feels like. Design is how it works.” We believe that truly great design is all three of those things. Not a single gown gets overlooked. Some people might say that we are fanatics. We are. You never know what you are looking for until you have tried them on. This style looks great on her, but how will that look on me? I love the color of my new sweater, but will a gown that color show up on the floor? How much is too much (or how little is too little!)? Seeing a gown on the hanger, or in a photo, or even on a mannequin will never do it justice. It comes to life when you put it on. You can see how it feels, how it moves, what it covers, and what it brings out in you. It must be comfortable AND you must feel comfortable in it – two very different things. You can’t be on the dance floor fidgeting with your gown; it will distract you (and the judges!) from your dancing. If you don’t feel comfortable in it, you may feel insecure and hold back when it’s your time to shine. Gowns will surprise you and (like men) you will know when you find the perfect one. What if I just can’t seem to find the right dress? Custom is the road for you! This gown fits perfectly, but the color is all wrong for me. This is the one I really want, but it’s not my size. I like this about that one and that about this one… or, I have a lot of my own ideas. Let’s get talking! Sometimes it is just best to start from scratch – and how fun, so much to choose from. After you have narrowed things down to what you want in a gown, we will put it all together for you. Some people come to us with just a concept where we will take the idea and refine it for them. Others tell us exactly what they want. Anything artistic you want we can do. How to try on our gowns? It’s easy and there is no obligation to buy. Browse through our today’s collection of available gowns. Once you have chosen a few gowns that you would like to try on, get in touch with us. Our experienced staff will answer any of your questions about the gowns and make arrangements to send them to you for a fitting. All fittings are overnighted and you will have approximately 24 hours to try it/them on. Keep an open mind. 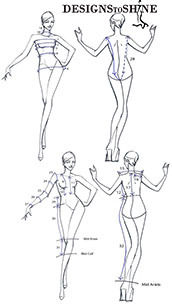 If the straps are too tight or bodysuit too short, etc… or if you don’t particularly like the style of the sleeves or neckline, etc…we can do alterations for fit AND design. We are experts at what we do and almost 100% of the time, we can alter a dress so that you would never know it had been changed. Once you have made a decision about the gown/s you can keep them and call us with payment, send them back for alterations or if they didn’t work out, just send them back. There is no obligation to buy, but shipping charges do apply. We request that all fittings be returned overnight.